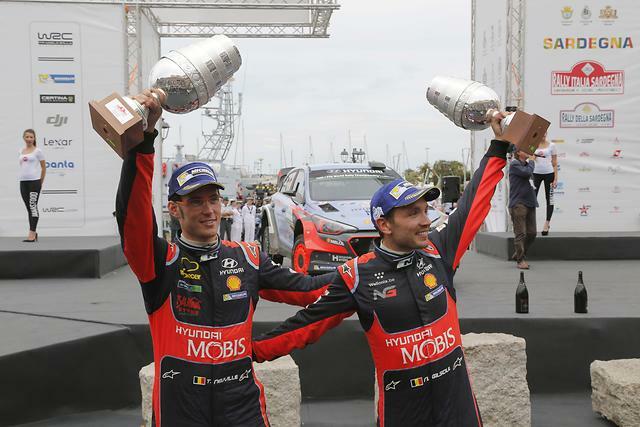 Hyundai Motorsport has secured its second victory of the 2016 FIA World Rally Championship (WRC) season with a dominant performance by the Hyundai Motorsport team’s Thierry Neuville in WRC Rally Italia Sardegna (June 9~12). Thierry Neuville has been on sublime form throughout the rally, extending his lead over Volkswagen Motorsport’s Jari-Matti Latvala on the final day to win the rally by 24.8 seconds. The result marks the second victory for the New Generation i20 WRC this season, and the team’s third win in total after Rallye Deutschland in 2014 and Rally Argentina back in April. Hyundai Motorsport team driver Dani Sordo also had a trouble-free run to claim his fourth consecutive fourth place position. Kevin Abbring, meanwhile, was on top of their game to finish second in the Power Stage, securing their first WRC points. For Thierry Neuville, the victory is the result of a concerted team effort as well as the improved performance of the New Generation i20 WRC, and marks his first victory in WRC since Germany 2014. It is the most accomplished performance of his career with nine stage wins within his rally history. Hyundai Motorsport has now taken podiums in five out of six rallies this season, with two victories, making it the team’s most successful WRC season even before reaching the halfway point. Next round of the FIA WRC, WRC Rally Poland, takes place from June 30 to July 3, and will mark the halfway point of the 2016 WRC Championship.